Do your sales depend on “foot-traffic” through the front door of your small business? If so, then Local Optimization is something we need to pay very close attention to. Local Optimization is a branch of online marketing that caters to small businesses that rely on a specific geographic region or community for their sales. These stats prove how important it is to be found when consumers are conducting local searches for businesses like yours. When a local search is done, it is critical that all your business information is correct and consistent with all the local directories that supply the search engines with your business information. 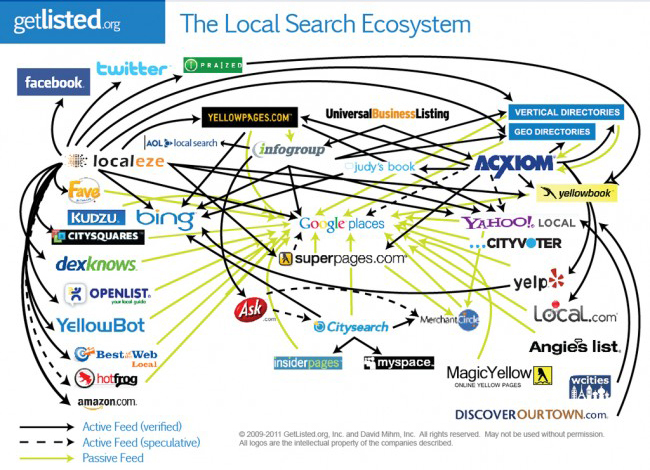 (See the local search ecosystem diagram above) If your business information is not correct across the internet you are much less likely to come up when a consumer does a local search for a business like yours. How consistent is your local business information with the local business directories?